We’ve tested a bunch of filter apps and shortlisted top 10 selfie editors that allow you to dress up your face with augmented reality camera effects. 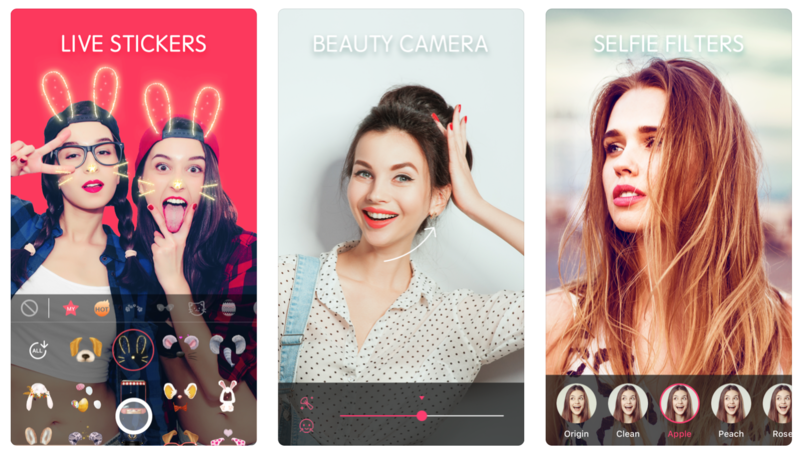 Whether you just love having fun with face lenses or planning to build your filter app like Snapchat and need inspiration, these apps will show you umpteen ways of taking your selfies beyond reality. We may be biased, but we hope to grow our face filters app into the best collections of selfie experiences. You can transform yourself into a celebrity, astronaut, or hipster. See yourself skydiving, on a beach, try on glam accessories, most crazy hairstyles and what not. Already now, we’ve designed over 1,000 AR masks for the past two years. See a sneak peek into some of them. And reach us out if you want to create your own face filters like Snapchat and use them in your app. Our make it possible! 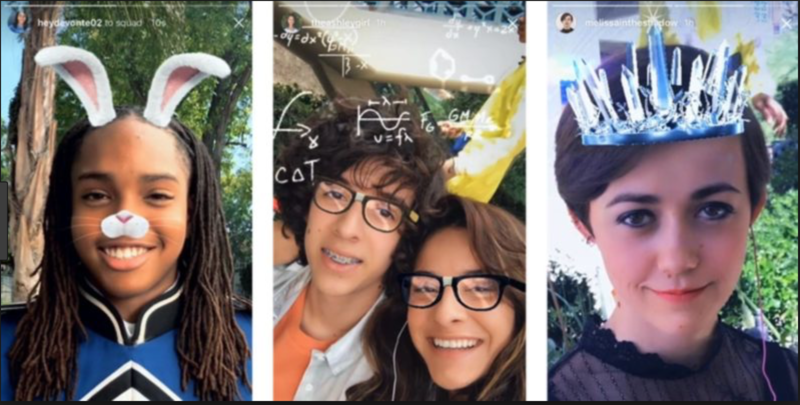 AR effects for different audiences - girls, boys and even your kids. Fun, beauty, scary, full-face masks, thematic, e.g. Halloween, Christmas, Love, etc. Realistic virtual try-ons (glasses, jewelry, hats, etc.). AR objects act as real ones throwing light, shadows and supporting physics. Effects with triggers, e.g. open your mouth to start an effect. We support 5 triggers: smile, open mouth, frown, eyebrows up and eyebrows down. Photo or video post processing. Apply filters to already created images. A novice user may find MSQRD a mediocre face filter app. It has basic effects and no updates for a long time. However, everyone dealing with face filters knows well a MSQRD-Cinderella story. 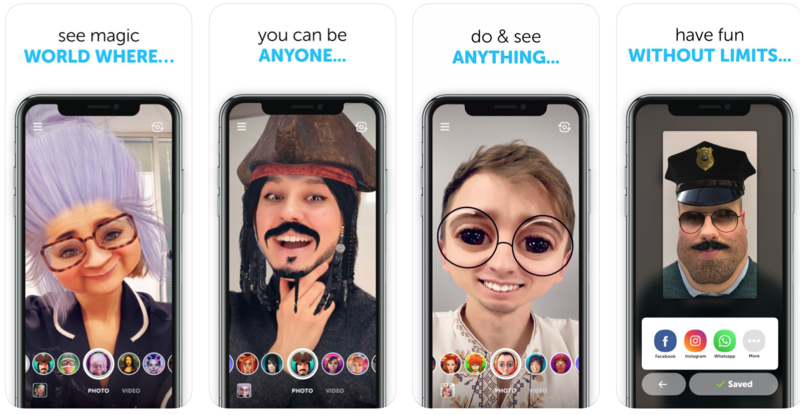 A startup from Belarus has started with an innovative concept of face tracking application - a fun app with face filters. One day Facebook called with an offer to take Cinderella to the faraway Silicon valley, and they did. The sum of the acquisition has not been disclosed, but one can guess the number of zeros. Polished and evolved, MSQRD is now a part of Facebook face filters, but the original app deserves the spot in the list. A second in popularity Snapchat 's rival. Unlike most face filter apps, Instagram already had an enormous user base when it rolled out its face filters. 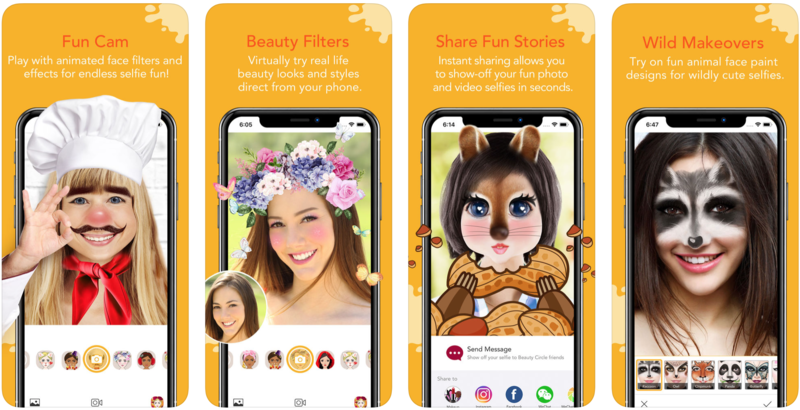 While someone may debate Instagram’s copying of filters from Snapchat, the most popular social photo-sharing network for mobile is getting bigger and bigger leaving other face filter apps like Snapchat far behind. A worthy adversary and another selfie filter app that you’ll definitely like. The YouCam Fun app offers a great collection of 3D face filters and live stickers. What makes YouCam Fun stand out is its animal face filters to bring your wild side to life — a cat, deer, snow leopard, or tiger. The app also has a sleek performance. Face filters stick well to your face even when you move or overlay them with your hand. Plenty of face filters - hairstyles, animals, live stickers, AR effects and more. Fast face detection and face filter placement. The app that goes beyond face augmented reality filters. B612 introduces real-time 3D emojis that copy your mimic. Color the sky putting effects on it. Have fun with AR objects that you can place at the surface. Beautification filters allow adjusting your face shape and applying makeup, however it needs improvements. Of all the apps, B612 can arguably boast of the most varied types of camera effects. Live avatars with micro-expressions and real-time background change. AR stickers that you can put on real surfaces with a back camera. What strikes you most from the first visit to the LINE camera photo editor is its super clean and user-friendly design. You can intuitively navigate among face filters and apply some really cool effects and motion stickers. Besides, it’s a great example showing "better less but better". Its collection of face filters is not that large as in other apps, but you can come across some really cool effects the competitors would want to copy in their apps. Super clean and user-friendly design. Unique effects with interesting concepts. 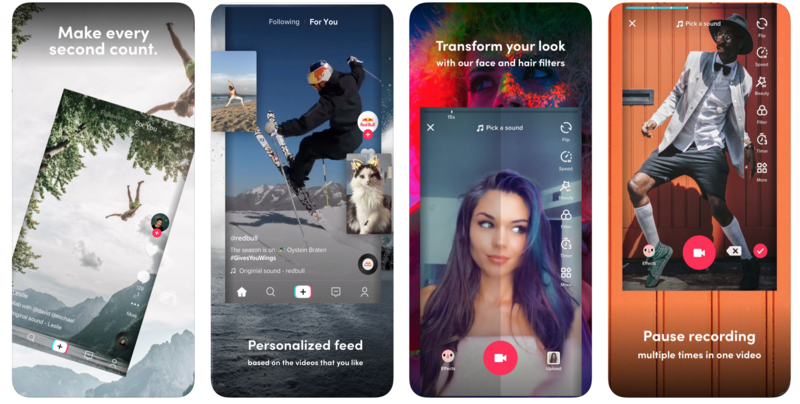 What makes TikTok stand out among other filter apps like Snapchat is its video community-based concept. In 2018 they acquired Musical.ly (another video-sharing app) for $1 billion along with its users. TikTok's strong positioning as “a destination for short-form mobile videos” has made it the most-downloaded free app on the Apple App Store in the US in 2018. Its camera filters allow any person to become a creative clip-maker, and you can use them for photo selfies too. Theme-based, AR filters for cats and dogs, face filter with triggers — the choice varies. Thematic face filters, masks for dogs and cats. A variety of funny face filters with triggers. You can add custom music to video clips and set permissions who can see and comment on your content. While most apps like Snapchat go for a face filter variety, Face Swap has opted for one simple yet funny feature — switch your face with a friend, celebrity or anyone. And the best part is that you needn't upload photos. Place two faces in the camera and the app does the magic in real time. Real-time face swap with the option to take a photo or video. 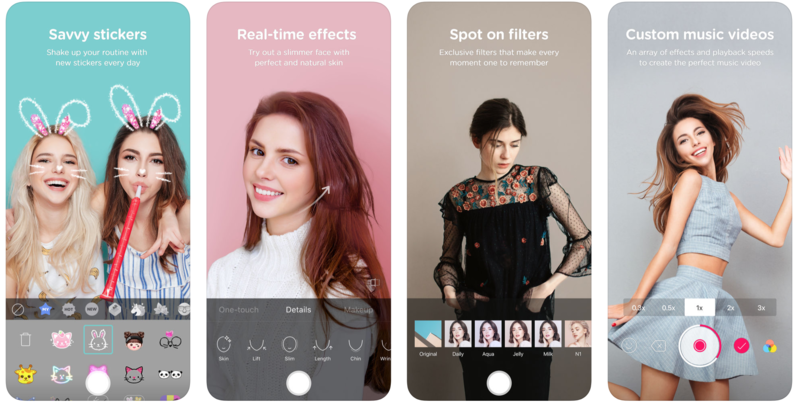 Amazing in its variety of live face filters yet a little bit disappointing it their performance, X Photo Editor can be a good source of inspiration for selfie fans. Yet, you need to be careful with in-app pricing. Users complain on tricky subscription policy. Age and gender face change. When you need just a lightweight app to dress up your selfie with AR ears or noses, the Sweet Face Camera can be a good choice. Its beautification feature can't beat most top devices' native camera capabilities. However, the easy-to-use collection of stickers will catch your fancy if you don't want to change your original selfies significantly. Clean design and easy to use stickers. Big players and audacious startups, they all utilize the same technologies to make camera filter effect come to life, i.e. face tracking and augmented reality. They all allow you to play with your face in the most extravagant manner — animating, beautifying, dressing it up or completely reshaping. They all keep the focus on video effects and social sharing. But what makes them different? The quality and type of face effects that make people choose one face filter app over another. Want to create your own face filter app with features like Snapchat? Or design a custom AR filter and add to your app? Get in touch!